Stars of the world arm wrestling, taking part in a series of fights Vendetta ALL Stars - Armfight # 50 acquired their Star status not only through successful performances in professional tournaments. There are years of hard training and more importantly - a professional approach to preparing for the fight. 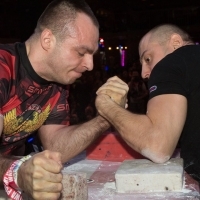 According to Igor Mazurenko, there are no universal prescriptions in the arm-wrestling training process. With the acquisition of experience, the most successful athletes learn to listen to their body, adapt training programs and loads to their anthropometric indicators. With the appearance of such a format of competitions as armfight, they also learned how to find a balance between strength and endurance. Devon Larratt, known to everyone as the most endurable armwrestler of the planet - is no exception. Whether due to a natural gift or as a result of previous training experience, his endurance has no analogues among today's champions pool. At the same time, many experts and former rivals of Devon still question the "no limit" power capabilities of the arm-wrestling star. Devon records a lot of videos, in which he shows the exercises that usually does and many fans of his style try to follow his advice. With his extraordinary natural endurance, Devon Larratt can afford an extreme strength training and work at full. He faces the fight with Denis Tsyplenkov, according to many - the most powerful arm wrestler in the world. Perhaps for the first time in his career, Devon will have to pay so much attention to strength training. No matter how his match with Denis ends, in November we should see a completely new Devon Larratt.